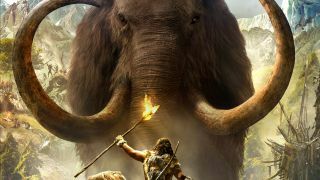 The “Legend of the Mammoth” preorder bonus for Far Cry Primal is a series of three missions in which you drink the shaman's concoction, get super-duper high, and then become an “almighty mammoth”—within the confines of your primitive, drug-addled mind, I'm assuming—and stomp your enemies into paste. It was actually announced last October, but today we finally get to have a look at it. Legend of the Mammoth includes three missions, called Duel of Beasts, Hunt the Hunters, and The Trapped Elder. None of them appear to be especially subtle in terms of gameplay, which I suppose isn't surprising given that they're all played from the perspective of a furry mega-elephant with anger issues. You will stomp, you will gore, you will occasional trumpet to remind everyone nearby of your awesome presence, and you will ultimately go extinct during the Holocene epoch, about ten thousand years ago, give or take a millennium or two. Sorry guys, you had the big bodies but we've got the big brains. Far Cry Primal will be out on March 1.